Palermo bay with castle on the island in Albania. In 1984, when Albania was an isolated communist state in the same mould as today’s North Korea, a Mercedes in a convoy carrying a visiting German official overheated on Mt Llogara, overlooking a bay on Albania‘s rugged Ionian coastline. Emerging from his car, Franz Josef Strauss, then minister-president of Bavaria and one of the rare Western officials to step foot inside Enver Hoxha’s Albania, was struck by what he saw. 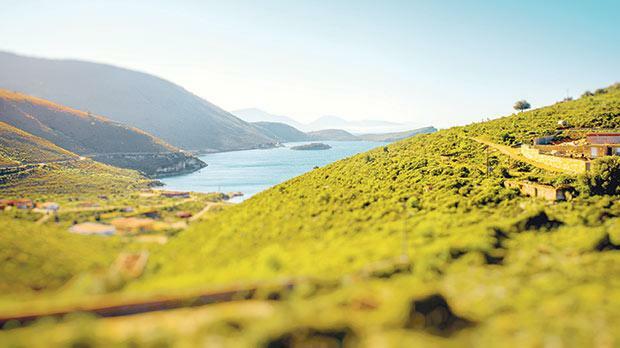 Three decades later, Albania’s Bay of Porto Palermo, its castle and its deep blue waters are one of the country’s top tourist attractions, featured on European newspaper and Internet lists of places to visit for those with a taste of adventure. Once host to military vessels and submarines, Porto Palermo was closed to the public under Hoxha. It opened a couple of years after communism ended in 1991 and Albania began its white-knuckle ride to capitalism. Fortezza di Ali Pasha, Porto Palermo, Albania. Nowadays, the bay takes its appeal from its seclusion, situated just below a two-lane coastal road and as inviting to foreigners as it was once forbidden. German, Czech and Hungarian tourists lose no time in stripping off and bathing naked. “No one bothers them; no one’s around,” said the bay’s caretaker, Klearko Koci. The area is rich in history, myth and legend, part of a coastline blighted in parts by high-rises but still unspoilt in others. Just down the road, a tiny isthmus reaches out to a round rocky island, between two capes embracing the blue waters on both sides. On the island sits a castle believed by some to have been built by the Ottoman Albanian ruler Ali Pasha in the early 19th century, surrounded by trees and bushes of vibrant colours, contrasting with the deep blue. The best view is from the balcony where Ali’s young bride used to comb her hair, Koci says. 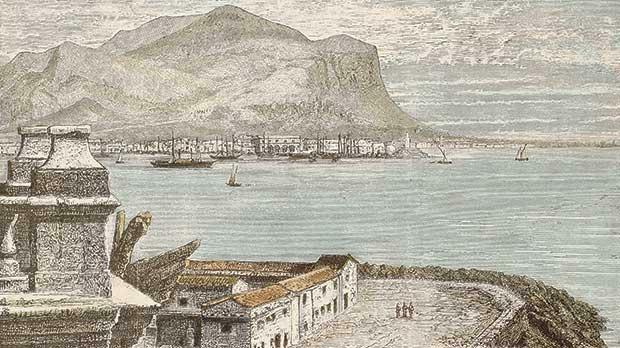 An old print shows a view of Palermo bay from Porta Felice roof terrace. The original engraving may be dated to the second half of the 19th century. “Seamen! Sail your ships inside the bay where there is no wind. I was built by the Himara women to be kind to friends and fierce to enemies. I belong to the Lord of sea and land, Ali Pasha,” declared a plaque that once stood on its gate. Informed by local legend and song, Koci says Pasha built the castle on the ruins of the Monastery of St Nicholas. 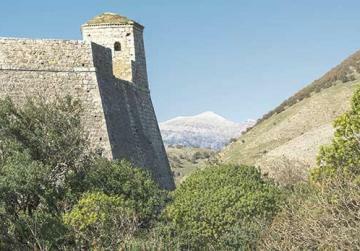 Foreign scholars, however, say the structure was originally a Venetian fort used to protect trade routes. Whether the Lion of Saint Mark really featured on the lost plaque will never be known unless it shows up one day. It was stolen in 1997, when Albania plunged into anarchy with the collapse of pyramid investment schemes and the country became known as a Balkan Wild West. It’s now a member of Nato and a candidate to join the EU. 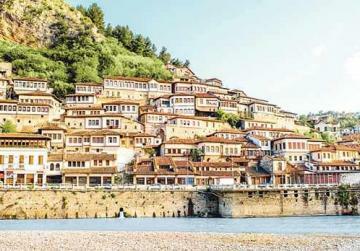 Albania boasts numerous world-class sights. Ceramic amphorae, used to carry oil and wine and found at the bottom of the bay, show ships plying the route from Corfu to Italy would stop at Porto Palermo, local diver Xhemal Mato said. On the shallower side of the island, the seabed bears the marks of fishing with explosives and mining of rock for mussels. Built of stone, the castle lets in light through small windows. Once past the main gate, visitors find their way to the top or the balcony through arcades from a main hall. Directions in Italian are a sign of its occupation during World War Two. The well is still unexplored, the caretaker laments. In 1803, Ali Pasha offered the castle and port to the British Royal Navy. A British scholar wrote that it had up to five cannons at the time, which meant the Pasha “did not see the fort as important for him”. On a narrow strip of land connecting the castle to the mainland, old, squat army barracks still bear the red-paint slogans of the communist era - “Long live the Albanian-Chinese friendship” and “Long Live the Communist Party of China and Comrade Mao Zedong“. Porto Palermo tunnel in military zone, Albania. Oak trees dot the top of a mountain rising steeply behind the bay. Agave trees were imported from China and presumably planted to discourage a landing from the air with their thick pointed ends. Hoxha was notoriously nervous about the possibility of a foreign invasion. Unfortunately, Porto Palermo has yet to get the care it deserves to highlight its treasures beyond the passionate tales of a caretaker enchanted by his stones, trees and flowers. Zamir Dedej, head of an Albanian NGO, works with the World Wildlife Fund to protect the area, so it offers a sustainable future in tourism. They see a second fish-growing operation in the bay as an abomination since their secretions pollute it. Auron Tare, the head of a newly created coastline agency, said the castle and a kilometre-long underground tunnel built in communist times will provide the main attractions. “The Albanian government has plans to open up the bay of Porto Palermo to tourism, specifically boat, yachts, pleasure yachts, cruise liners who come around here but do not stop here,” Tare told Reuters. The government has mobilised the army and volunteers to clean up rubbish from roads and the beaches. At one southern beach this week, a group of British tourists cleaned the beach as locals sat in beach recliners. At Porto Palermo, Dutch vacationer Agnes Kuijl, said her family had come travelling in their mobile home via Greece and had found both countries a great experience. 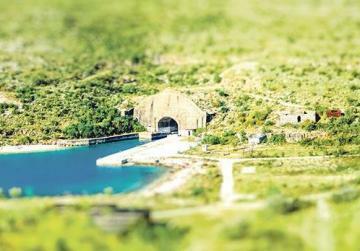 Other foreigners with vehicle-drawn homes had camped out on the isthmus at Porto Palermo. Kuijl’s family were bathing.